Yes, honestly... some poor boy landed in fox poo during a cricket match and poo stopped play while he was cleaned up by a flurry of cricket mums with wipes. It begs the question, at what age do children stop needing wipes? 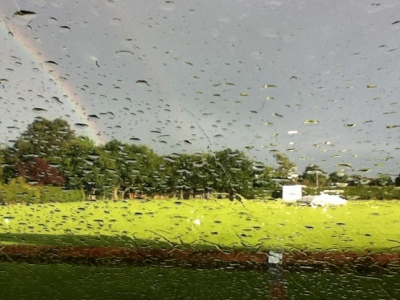 Today's match was just the usual 'rain stopped play'. Gosh how dull. Nice rainbow though.